This is about an 8-minute, multi-sectional composition. Your audiences will love this clever baroque flavored chart. As recorded on the new Les Hooper Big Band CD "Out of the Woods"," this hot, blues shuffle is full of energy and good ol' down-home funky blues. As recorded on the new Les Hooper Big Band CD "Out of the Woods"," this clever, quirky, swinging chart is terrific. Just what it sounds like . A terrific funk chart! Lots of space for optional solos. There is always room for a jazz waltz, and you will love this one. This is exactly as recorded on the Hooper CD "Out of the Woods. A monumental piece of big band jazz. This standard is made even more beautiful with this Hooper arrangement. This is a very fresh sounding, interesting and fun piece . An up-tempo be-bop type chart, with the clever, interesting writing we have come to expect from Les Hooper. 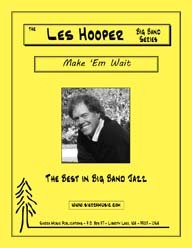 Les comes up with another sensational showpiece for your band. What a great , fun-filled piece this is! Les has created a mythical character (in this case, the lead trombone player) who runs through a number of "musician jokes" while referring to his "brother. The title says it all! Your band and your audience will have a good time with this chart by Les! It is a Latin-rock setting of a very hiptune. As recorded on Les' LP Dorian Blue (Churchill Records). This Cole Porter tune has become a jazz standard because of a great melody and great changes. Once again Hooper leads the way with a chart that is simple to play but still great to listen to and to play. One of the Basie-style charts that Les is so great at writing. This is a great swingin' blues chart that is playable by most any band. This is exactly as recorded on the new Les Hooper Big Band CD "Out of the Woods. Les has come up with another new, wonderful, medium-up-swing chart that will surely be a best-seller. This chart is a play on Minnie the Mooch and somewhat set in that era. Les has created another techno-swing chart that has overtones of the old swing band style, but it is set very much in modern day fashion. This is a dazzling arrangement of the great jazz standard. With a mix of Latin and swing, Les has created a special setting of this favorite of jazz players. This is Hooper at his best . Les calls this funky, fire-spitting rock! This is another off the Hooper chicken rock charts. Les Hooper has a way of creating charming, interesting and playful music and not making it too hard to play. Here is a great swing/shuffle chart by Les. This up-dated issue of the former Creative World chart is Hooper at his best . This is a lovely, bossa-type ballad which is captured by soft sounds from the whole band, especially flugelhorns. Les has written a thoughtful, lovely Latin tune. This is a delightful piece that would provide some energy and variety to any concert program! This is a fast, swing chart that is a feature for tenor saxophone. This is a lovely, straight-eighth waltz that starts simply and quietly with the rhythm section. As recorded on the Les Hooper Big Band's Anything Goes, this is a lovely, contemporary, rock ballad, which features alto saxophone throughout.